In 1996, the Wildflower Association of Michigan sponsored an informal wildflower preference poll in newspapers throughout the state. The Association invited citizens to vote for one of six native plants for nomination as the state's official wildflower. The large-flowered white trillium garnered 1,733 votes to secure first place in the poll. The dwarf lake iris came in second with 1,479 votes. Following the dwarf lake iris were the Michigan lily, with 475 votes, wild lupine, with 386 votes, bloodroot, with 259 votes, and hepatica with 120 votes. While the large-flowered white trillium grows throughout eastern North America, the dwarf lake iris grows only in the Great Lakes area and most of the world's population of this iris is found within the borders of Michigan. The dwarf lake iris is considered threatened on the state and federal levels. On June 12, 1997, House Bill No. 4923 was introduced in the Michigan House of Representatives. It proposed that the second-place dwarf lake iris be declared the state wildflower. With the support of the Michigan Botanical Club, the Michigan Nature Association, the Michigan Natural Areas Council, the Michigan Environmental Council, and the University of Michigan Herbarium, State Representative Liz Brater of Ann Arbor introduced House Bill No. 4923 nominating the threatened dwarf lake iris (Iris lacustris) as the official state wildflower of Michigan. No doubt one of the purposes of this bill was to draw attention to the causes of protecting the dwarf lake iris and conservation in general. Development of Michigan lake shorelines was threatening the habitat of this plant. Bill sponsor Rep. Liz Brater was considered a leader on environmental issues and is the past Land Use Director of the Ecology Center. She served as the Vice Chair of Natural Resources and Environmental Affairs and the Agriculture, Forestry and Tourism Committees. In recognition of her leadership in protection of the environment, she was named the Sierra Club Environmentalist of the Year in 1996. The Wildflower Association of Michigan did not react kindly to House Bill No. 4923 and called it "an outrageous power play by select environmental interests over the interests of the people of Michigan." The efforts of the Wildflower Association of Michigan may have been doomed from the beginning however. 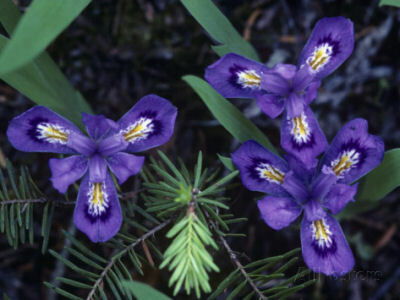 Promoted as a symbol of the state's efforts to balance growth and conservation, the dwarf lake iris gained majority support because it was so unique to the State of Michigan. House Bill No. 4923 was passed in both the House and Senate and signed, although not enthusiastically, by Governor John M. Engler on December 29, 1998 with an effective date of December 30, 1998. Evidently the governor was not a fan of "official state anythings." The following information was excerpted from the Michigan Compiled Laws , Chapter 2, Section 2.81. The dwarf lake iris (Iris lacustris) is designated as an official wildflower of this state. "Tidbits." The Daily Globe 25 Jan. 1997. Web. 27 Sept. 2005. "Lawmakers to debate merits of the dwarf lake iris." Detroit Free Press 4 Oct. 1997. Web. 27 Sept. 2005. "Dwarf lake iris bill passes!" Michigan Sierra Club 8 Dec. 1998. Web. 28 Sept. 2005.
" House Bill 4923." Michigan Legislature 31 Dec. 1998. Web. 29 Sept. 2005. "Michigan Compiled Laws." Michigan Legislature 31 Dec. 1999. Web. 29 Apr. 2015. < http://legislature.mi.gov/doc.aspx?chapterindex>. 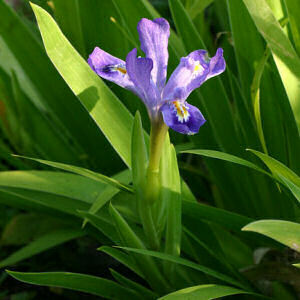 Plant Profile for Iris lacustris Nutt. (Dwarf Lake Iris): USDA, NRCS. 2004. The PLANTS Database, Version 3.5 (http://plants.usda.gov). National Plant Data Center, Baton Rouge, LA 70874-4490 USA. Dwarf Lake Iris (Iris lacustris): Article about the dwarf lake iris by Elaine A Chittenden with assistance from the Natural Heritage Program and Michigan Natural Features Inventory staff. Article about the dwarf lake iris by Elaine A Chittenden with assistance from the Natural Heritage Program and Michigan Natural Features Inventory staff. Dwarf Lake Iris: Endangered species fact sheet from the U.S. Fish and Wildlife Service. Michigan Botanical Club: Website of the Michigan Botanical Club, the native plant society for the state of Michigan and the Great Lakes Region and the home of the Michigan Big Tree Program. Wildflower Association of Michigan: Web site of the Wildflower Association of Michigan, Grand Ledge, Michigan. Lady Bird Johnson Wildflower Center: Website for the Lady Bird Johnson Wildflower Center in Austin, Texas. Iris lacustris Nutt. (Dwarf Lake Iris): A network connecting science with conservation - NatureServe Explorer: An Online Encyclopedia of Life. Iris lacustris Nutt. : Integrated Taxonomic Information System (ITIS) Here you will find authoritative taxonomic information on plants, animals, fungi, and microbes of North America and the world. More symbols & emblems: Complete list of official Michigan state symbols from NETSTATE.COM. 278 wildflowers found in the meadows, woods, dunes, shores, and wetlands of Michigan. Each stunning photograph is coupled with a detailed plant description, including scientific and family names, habitat, growing season, and protected status. Plant descriptions include location, seasonal display, height, and information on whether the flower is protected and should not be picked or moved. The flower photographs are grouped by color for ease of location and then listed in the order in which they appear during the growing season. Field Manual of Michigan Flora is the most up-to-date guide available for all seed plants growing wild in Michigan. It presents concise identification keys, information about habitats, and completely updated distribution maps for all the seed plants, native or naturalized, that have been recorded from the state, fully treating over 2,700 species. All non-native species are included with notes on their first discovery in the state and comments on invasive tendencies. Rare native species that appear to be declining or to have shrinking ranges are also noted. Landscaping with Native Plants of Michigan is designed for beginning and experienced gardeners who want to learn more about Michigan’s unique native-plant communities and how to successfully incorporate them into their home landscapes. It combines the practicality of a field guide with all the basic information homeowners need to create an effective landscape design. The plant profiles section includes comprehensive descriptions of more than 600 native plant species, subspecies, and varieties of flowers, trees, shrubs, vines, evergreens, grasses, and ferns that have grown in Michigan since the time before European settlement. Information on planting, maintenance, and landscape uses for each plant is also included. Many great creative ideas from a section featuring Michigan gardeners who have successfully incorporated native plants into their home landscapes.